In the early days of America, so-called blue laws restricted many activities on Sunday. In recent years, however, state governments have recognized that the people`s right to choose for themselves what they do, or don`t do, on Sunday is more consistent with America`s founding principals. Present day bans on Sunday hunting are the last holdouts of these blue laws, and hunters are questioning why they are being treated differently from their fellow citizens. The majority of hunters will agree that the biggest obstacle to hunting, and the biggest obstacle to recruiting new hunters, is lack of access and opportunity to hunt. By restricting Sunday hunting, states are not only limiting opportunities for today`s hunters but are making it harder to recruit new hunters to carry on our proud heritage. Anti-hunting groups understand this, that`s why they oppose lifting Sunday hunting bans--they don`t want a new generation of hunters to enter the field. This opposition to Sunday hunting is in fact opposition to the future of hunting itself. Restrictions on Sunday hunting treat hunters as second-class citizens. Other outdoor activities are allowed on Sunday, including fishing, hiking and golf. By restricting hunting and not other activities, state governments are sending a not so subtle message to hunters and non-hunters alike that there is something wrong with hunting, that it isn`t as legitimate an activity. This message ignores the fact that hunters contribute billions of dollars to the benefit of wildlife, both through license fees and excise taxes paid on firearms and ammunition. Sunday hunting has no detrimental effect on wildlife populations. The 43 states that allow some form of Sunday hunting have healthy wildlife populations in those areas that can sustain them. In fact the states with the most abundant game populations allow Sunday hunting. Those states that have recently removed prohibitions on Sunday hunting have not seen a negative impact on game populations. Allowing Sunday hunting will give state wildlife agencies more flexibility in managing populations. The extra day a week for hunting will give the agencies the ability to increase hunting in areas of overpopulation by encouraging hunters to go afield. The most common reason that hunters stop hunting is lack of hunting opportunity. Hunting opportunities are largely decided by two factors: accessible land and available time. Since most hunters work Monday through Friday, a ban on Sunday hunting cuts their available hunting time in half. Sunday hunting is an excellent way to recruit new hunters. Many young people have school or athletic obligations on Saturday. Allowing Sunday hunting means that parents can spend time hunting with their son or daughter, passing on a heritage that is so important to America. With the myriad of activities that compete for the attention of young people today, a restriction on Sunday hunting means many of them never take up the sport. Sunday hunting will bring an economic benefit to many rural areas. Every day that hunters are in the field, they spend money on gas, food, lodging and the dozens of other incidentals that go along with a day`s hunt. The ripple effect of this spending can have a major impact on a rural town or county. Out-of-state license revenue can grow as a result of Sunday hunting. Few hunters will take extended hunting trips to a state that won`t let them hunt one day of the week. These out-of-state hunters pay higher license fees that benefit the game department and also spend even more money on incidentals than in-state hunters. 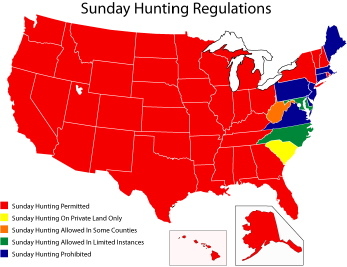 Currently seven states entirely prohibit hunting on Sunday for wild game; they are Delaware, Maine, Massachusetts, Pennsylvania, Virginia, New Jersey and Connecticut. All of these states have considered legislation to lift the bans in recent years. Repealing the Sunday hunting bans has been actively supported by the wildlife agencies in Maine and New Jersey. Four states allow limited Sunday hunting: Maryland allows hunting on two Sundays during deer season; South Carolina allows Sunday hunting on private land only; North Carolina allows Sunday hunting on some federal installations; in 2001 West Virginia enacted legislation that allows Sunday hunting on private land, but each county can hold a referendum to ban Sunday hunting; currently 14 counties allow it. New York: In 1996 New York opened Sunday hunting on three Sundays during deer season. Within five years the law was changed to allow all Sunday hunting, except on specifically designated lands. Ohio: In 1998 Ohio passed a bill allowing a test of Sunday hunting on public lands for a period of three years. In 2002 the legislature made Sunday hunting permanent without opposition from groups that had concerns when the test began. The state wildlife agency supported the change. Michigan: Sunday hunting was banned on private land in certain counties, but in 2003, all Sunday hunting closures were repealed. The bill was supported by the state wildlife agency. None of these states have experienced the horror stories forecast by opponents of hunting. The states continue to have healthy wildlife populations. Hunters continue to behave in a responsible and safe manner. Church attendance remains unchanged. Landowner-hunter conflicts have not increased. In sum, Sunday hunting has had nothing but a beneficial impact on these states and the future of hunting in them.